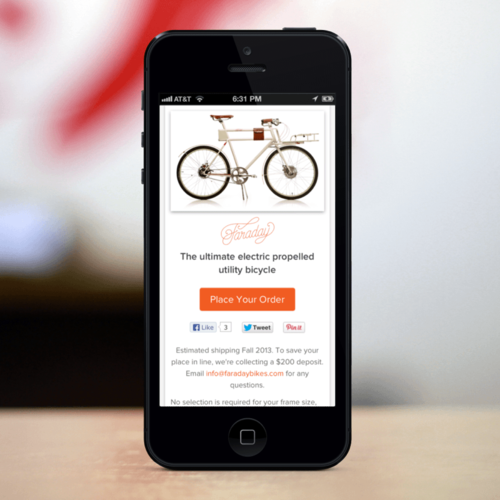 Celery lets companies take pre-orders on a modern, easy-to-use e-commerce platform. Upload an image of your product, set the price and start selling. We have a ton of great customers, and we’re riding the crowdfunding boom, but life wasn’t always this simple. It was April--Call Me Maybe by Carly Rae Jepsen was number one on the radio--and we had just received an exploding term sheet from an accelerator in New York City. That meant we had 48 hours to take their investment and a place in their program — or walk away. The accelerator we really wanted to get into was Y Combinator, but they weren’t even starting interviews for another month. The two programs were mutually exclusive, and we knew the right one could make or break us. The clock was ticking. We sent an email to Paul Graham, the head of YC, explaining our situation. A few minutes later, we had a response. Fly out in the next two days for an interview, and he would tell us if we were accepted before our other offer exploded. There were three co-founders at the start. I had studied electrical engineering and computer science at MIT, before a stint as an investment banker and VP at Groupon. Brian, Co-Founder of Celery, had worked on mobile media for Fox, and put his time in as an analyst at Jefferies. We both had experience coding, but only Peter had been a professional programmer for the last ten years, including a stint on LinkedIn’s mobile development team. We went into the accelerator thinking we could do something in e-commerce. I’d helped Groupon create their China operations, and knew a lot of merchants were working with outdated, unwieldy and painful software. When Paul Graham heard our pitch, he got excited and said we should look at the mobile space, which was growing fast, and had different requirements than desktop shopfronts, shopping carts and marketplaces, which had defined e-commerce since its creation in the 1990s. E-commerce is huge. It generated about $260 billion in revenue for U.S. merchants last year, eMarketer estimates, an amount that is growing about 16 percent per year. Of that, mobile commerce accounted for about $42 billion, and is the fastest growing. By early 2013, after much trial and error and customer feedback, we knew what we had to make. Our software would be a way for new companies to take pre-orders. We launched in May, and basically pioneered the service of letting crowdfunding graduates take pre-orders. All those companies had an acute problem that no one had solved. They needed to capture demand months before they would have a product to ship. Most e-commerce software would force them to charge credit cards as soon as they took an order, but that exposed them to the risk of chargebacks. And chargebacks can lead to major problems with credit card companies. The rest of the year was a wild ride. We rode the crowdfunding boom, won over huge clients like Pebble and August Smart Lock, and met fierce competition and fought it off--even as Peter and our engineers were coding furiously to build out an API. By January 2014, our closest rival had been acquired (for an undisclosed sum) and we were alone again in the field, growing 30 percent month on month. Last week, we announced our seed round of $2 million, which came from investors like YC, Ron Conway’s SV Angel and Paypal co-founder Max Levchin. In the early-stage pre-order space that Celery already dominates, 3 million people pledged about $480 million to Kickstarter projects alone last year. Celery helps projects like these continue taking orders after their crowdfunding campaign ends. Many of them take pre-orders to finance new hardware and products amid what’s widely considered to be another industrial revolution. There are eight of us in the office now: three founders, two engineers, a salesman, a former journalist and designer. We solved the pre-order problem, and we’re helping some of our pre-order customers make the transition to live orders. With the crowdfunded community as our base, we’re building out our API to tackle the big problems e-commerce faces. Most vendors are still using legacy software, and it’s still really painful. We aim to fix that.